Zig Ziglar is the world’s foremost authority on motivation. An internationally renowned speaker and authority on high-level performance, His I CAN course is taught in more than 3,000 schools; and hundreds of companies and businesses utilize his CDs, books, and video training programs to motivate and train their employees effectively. As a sales trainer, he has lifted the careers of many thousands with effective strategies to not just make a sale, but to create a sales professional. “Selling is not something you to do someone, it is something you do for someone.” Zig’s Secrets of Closing the Sale audio training program is a must-have for anyone involved in the world of selling. Zig Ziglar has taught his values-based principles for becoming a more effective persuader and person to sales organizations, church groups, schools, and businesses. And he has reached thousands more through numerous television and radio appearances and through his popular audio and video training programs. For many years, his Sunday school class held at First Baptist Church, Dallas, was broadcast each Sunday morning, via satellite. Years ago, Zig Ziglar walked away from a record-setting sales career to help other people become more successful in their personal and professional lives. His background in successful direct sales has made Zig one of the world’s foremost Sales Trainers. His name is synonymous with confidence, motivation and success. A master at motivational speaking, Mr. Ziglar has been featured in The New York Times, The Washington Post, The Dallas Morning News, Fortune, Success and Esquire magazines, and has appeared on the Today show, 20/20, 60 minutes and The Phil Donohue show. Zig Ziglar’s unique brand of logic and enthusiasm are overwhelming. Just a brief exposure to Zig makes a fan of anyone. He has that rare ability to make audiences comfortable and relaxed, yet completely attentive. As an author, he has produced dozens of successful books, audio CDs, and video programs, including his flagship product, How to Stay Motivated. As a concerned citizen, Mr. Ziglar has been recognized in the Congressional Record of the United States for his many contributions to the American way of life. Over the last 30 years presenting himself and his motivational ideas, he has developed a national following. He has grown from a one-man show to chairman of the Zig Ziglar Corporation, headquartered in Dallas, with a staff of more than 60 employees — an organization which is committed to helping people more fully utilize their physical, mental, and spiritual resources. Zig has traveled more than 3 million miles throughout the world as a speaker and lecturer. 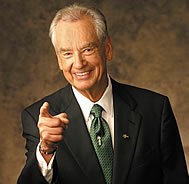 Let top motivator and sales trainer, Zig Ziglar, help you be a winner in every area of your life. It is with deep sadness that we announce the passing of Zig Ziglar, an exceptional speaker, educator, and motivational trainer, earlier today. He was 86 years young and energetic to the last. Zig’s values-based principles for becoming a more effective persuader and person are used in sales organizations, church groups, schools, and businesses all over the world. Zig Ziglar was a popular contributor to our MindPerk One Minute Motivators newsletter. Of all the hundreds of motivational trainers out there, my all-time favorite, the one I have recommend to more people and organizations than any other, is Zig Ziglar. Why? Not only did he have great ideas and solutions, he presented them with energy, humor, and enthusiasm. I’ve met Zig and watched him teach in person. What an amazing experience! A few years ago, I attended a live seminar that Zig had customized for a company. At the time, he was approaching 70 years old. I was amazed that he had more energy and enthusiasm than I did at 40! Zig Ziglar has had a profound influence on my life and I thank him for what he has taught me over many years. At MindPerk, we express our love, respect, and condolences to the Ziglar family. Zig’s message has positively impacted the lives of millions and will continue to inspire and educate generations to come.